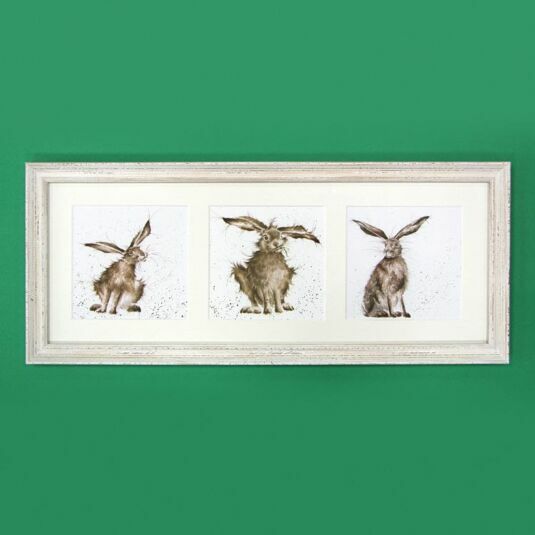 Decorate your home in the most beautiful way with this stunning trio of framed illustrations, the perfect house warming gift to make a house feel like a home and would also make a lovely gift to celebrate Easter. 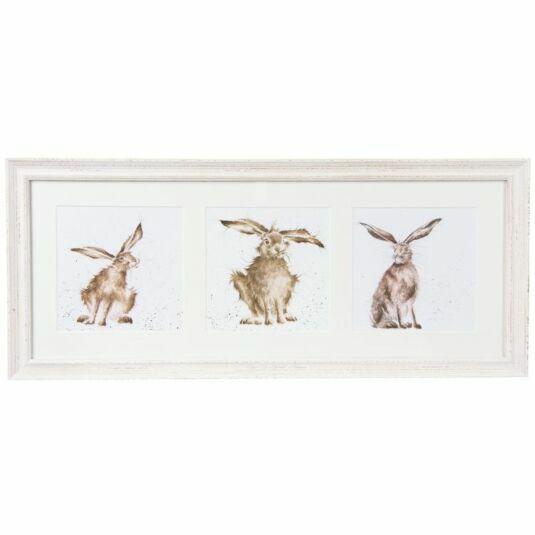 This framed print is themed around the wild Hare, featuring three different illustrations from Wrendale’s designer Hannah Dale. Each illustration is beautifully reminiscent of a water colour style, with flickering of paint across each background creating motion and realism in each piece. The illustrations themselves feature three Hares all posed in different ways, with the first in an alert manner, with one ear propped up and nose to the sky. The second Hare shows a more casual stance, munching on a blade of grass hanging from his mouth, with one ear drooped. The third Hare showcases a very strong and proud stance, placed in an upright sitting position with perked ears and glowing eyes. The frame itself is made from wood and coated in a slightly pink tinged cream colouring, rustically worked to give a vintage feel to the overall piece. Each individual illustration is housed behind a piece of glass, with a suitable 3 hook hanging system found on the back of the piece for easy placement throughout the home. This beautifully delicate framed print would make the perfect gift for anyone who enjoys the fresh nature of the countryside and the glorious animals who dwell there. Our apologies, due to shipping restrictions, UK Standard, UK Premium and International Airmail delivery services are not available on this item.